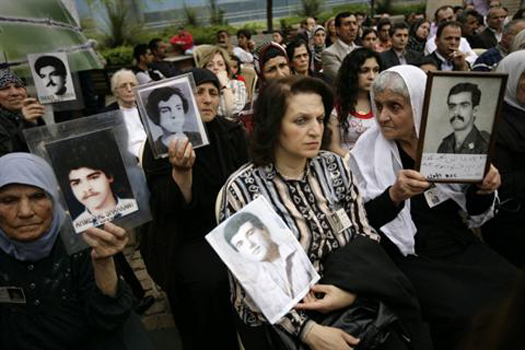 On March 4th, 2014, Lebanon ruled that families of missing and disappeared persons would be allowed access to the investigation files and full report of the Commissions of Inquiry on the Missing and Forcibly Disappeared in Lebanon. The State Shura Council, one of the highest judicial authorities in Lebanon, granted the families of the missing access to a huge archive of information gathered by the Committee that has remained classified for over a decade. In a new episode of our ICTJ Forum, we speak with Lebanese lawyer Nizar Saghieh, founder of the non-governmental organization Legal Agenda. Mr. Saghieh is the author of the Draft Law on the Missing and Forcibly Disappeared Persons in Lebanon, and has widely published on judicial and constitutional reform. Below, Mr. Sagheih answers questions from ICTJ. Listen to the interview in Arabic here, conducted by ICTJ's Inas Zeineddine. In its ruling on March 4th, the State Shura Council granted the families of the missing and forcibly disappeared access to the full report of the investigations of 2000 Commission. How will this ruling affect the victims’ groups? There are both direct and indirect effects. The importance of this ruling stems from the fact that it has established the right to know as a legal principle through a judgment by the high judicial authority, namely the Shura Council. So, now this principle is now part of Lebanon’s legal system. The right to know is a new right. In the early stages of the litigation, we were asked about the legal basis of this right: is the right to know established in a legal instrument in Lebanon? The answer is no; it is not set down in a legal instrument. Rather, its legal basis stems from all the rights that Lebanon has established through the ratification of the international instruments, such as the prohibition of torture, the right to life, the right to have a family, and the rights of the child, etc. We concluded that the right to know has emerged from all these rights and this is what we used as legal basis to recourse the Shura Council. Furthermore, the right to truth is a natural right; so it is unreasonable to ask the families of the disappeared to wait indefinitely. Because of this—and for the two reasons described above—the State Shura Council established the right to know. We note again that the right to know is not a self-evident right, it is rather a newly established right; and here is where this ruling has gained its importance. Firstly, it has established the right to know which is considered the major legal acknowledgment given to the families of the disappeared in Lebanon after the civil war up until now. Secondly, its importance also stems from the legal effects of the right since it gives the families the right to access everything regardless of the reasons given on political imperatives or the security situation. This underscores the importance of this right and its recognition as a natural right stemming from all other rights established in international covenants, because it provides for the right to access all documents without allowing the state to invoke the civil peace in order to prevent this access. The government commissioner and the Counsel Rapporteur in the lawsuit have raised this issue. They claimed that the families have no right to access these documents since that will jeopardize civil peace. However, the Council rejected these arguments. Everything that has previously been mentioned is related to the direct effects of the ruling. As for its effect on victims’ groups, it has a symbolic effect. Though from a legislative point of view, this ruling might achieve results for families: yet, whether the Lebanese government will implement the decision, is uncertain. We hope that the government will implement it. However, if it abstains from doing so, we will resort to several other measures, including media campaigns and international procedures. However, the focus today is on ensuring that the government implements the ruling. In case the ruling is implemented, we will review all the reports, and depending on their content, we will assess what their effect is on the families. If the reports contained investigations and information that are useful to the families, then this will indicate a positive effect on them; whether we find information about mass graves or about individuals who are still alive in Syria or other locations. As for the indirect effect, it will be through using the right to know in further litigation, and demands by the families based on this right. What are the measures that the state should take to implement the decision? Through handing us the file. We should emphasize that since this ruling has established the right to know, the state is obligated to take all necessary measures in order to enable the families to know the fate of the missing persons. It is clear that the state has a direct role in delivering the files, but what is more important is to put an end to the suffering of the families, and do whatever necessary to solve the issue. What are the difficulties surrounding the implementation of the decision? And what is the role of civil society organizations in case the authorities failed to implement the decision? If the authorities fail to implement the ruling, they will be practically in collision with the judiciary and not recognizing its independence. Any refrain from implementing a judicial ruling is a strike to the independence of the judiciary. So, what are the measures that civil society can take to protect citizens from a government that disrespects the law? Of course, there is an important role for the media in shedding light on this issue. However, it is also important for civil society to act as well, through organizing events, monitoring the government’s actions and exposing its failure if it does not implement the ruling. In my opinion, it is also possible to pursue international action, such as approaching Human Rights Council in Geneva. What are the anticipated legislative and executive actions that the families will demand from the state if the decision is implemented and they are able to examine the investigation files (protection of the mass graves, identification of victims, establishment of commission, etc.)? Legislative actions are important, and the families’ position in this regard is very clear. They have submitted a draft law, and they are sticking to it. The new development, however, is that the ruling is one more reason to enact this legislation. In the past, we were insistent on recognizing the right to know, and now we have a ruling to bolster this advocacy. Practically, this is the only thing that has changed at the legislative level. As for the executive level, it comes after the legislative one. However, until this law is enacted, we call on the executive authorities to take measures as soon as possible to protect the graves guaranteeing the rights of the families to know the truth. At the time of reporting on the investigation of the 2000 Commission, the short report referred to the lack of laboratories that would assist identifying those buried in mass graves. After 14 years, did the state acquire the technology to conduct DNA testing? Currently there is a laboratory at the internal security agency, and it is available to be used for this purpose. However, we need some international expertise do deal with these matters. I think that the International Committee of the Red Cross has offered its services. The Council’s decision ruled that the families have the right to know the fate of their beloved, how can this be employed in reviving the process for passing the draft law? Through accepting more lawsuits. This was the main challenge for us. Cases like this can break the silence. The judiciary can break the silence. Enough groveling at the doors of the political leadership! We should go to the judiciary and speak of justice. And that is what today’s ruling has achieved. I think that for the political class to deal seriously with the issue of the disappeared persons, the main solution and weapon will be more lawsuits. The decision cited international resolutions to support the right to know, what are the important factors for positive ruling based on international resolutions? Will this affect other ongoing and upcoming litigation, and if so, how? First, we have to see if this ruling will also be used at the level of international law. Lebanon does not merely adopt international laws but contributes to developing them as well. I think that the whole debate about the law is to decide whether the right to know has become a general international principle. Advocates of this right seek to gather judicial rulings from several countries to bolster the evidence of an international trend towards establishing the right to know as a recognized right worldwide, and as a basic right. Hence, this ruling is very important at the international law level, given that invoking international law by national courts is not a new phenomenon. It is known that international instruments are considered part of the Lebanese constitution, thus invoking international law is familiar and can be resorted to in national courts. However, what distinguishes this ruling is the number of basic rights that are mentioned in it. If we read the ruling, we will find 7 or 8 basic rights that the ruling has considered that constitutes the right to know. Furthermore, we should not ignore a new notable development in the Lebanese law, namely the recurrence to the natural right. We always refer to the existence of a natural right, and this is normal in any society that senses the cruelty in which the legislator attempts to frame public life through the legislative and executive authorities. The natural right has also been invoked to challenge laws and recognize the existence of basic rights that each human being must enjoy, whether recognized by the government or not. This matter endorses as well the importance of this ruling. On the other hand, this ruling will surely have an effect on current litigation, since the right to know is now a recognized right. We have resorted to the judge of urgent matters to demand imposing protective measures, and the judiciary has never refused our demands, rather it appointed experts. This leads us to infer that the right to know is established. Today, the right to know has been explicitly established, and not only inferred. The reference to this right is also recognized and the way it is linked to international instruments as a consequence or an integral part of the rights established by these instruments, and hence integral part of the constitution itself. What is central, as noted earlier, are the implications of this right, and the judiciary’s awareness of these implications. In this context, I support what Ms. Widad Al-Halawani mentioned about the establishment of the right to know as a weapon in the hands of the families for the future.